Eighteen events in and we've the first British World Series of Poker triumph of 2015 to report. Take a bow John Gale who has won the WSOP $1,000 NLHE Turbo event. Gale, from Bushey in Hertfordshire, pocketed a first prize of $298,290 after topping a field of 1,791 runners at the Rio. After eliminating Birmingham's Stuart Rutter in fifth, Gale ran over the rest of the table, sending Andrew 'Bruce' Le and Matthew Vessier to the rail to set up a heads up clash with American Gary Luther. The Englishman started two-handed play with a huge lead and didn't take long to claim the title. After an initial raise from Gale, the short-stacked Luther pushed all in which the Englishman was happy to call off with pocket 2s. The American revealed Ac3s. An 8h4h4d flop offered extra outs but the 10s and 9c on the turn and river gave Gale the win. "It is still incredible. 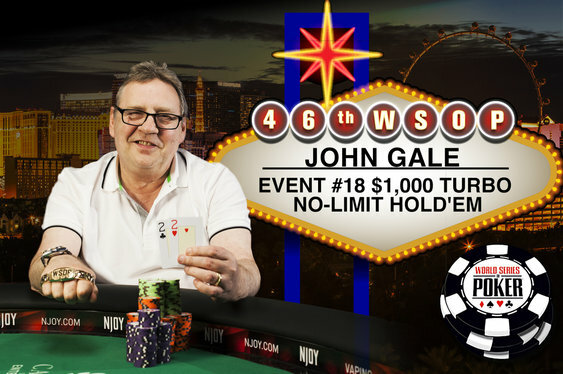 I cannot believe it, I am over the moon," Gale told WSOP.com. This isn't the first taste of World Series glory for Gale. The 61-year-old won his maiden bracelet in 2006 after taking down the $2,500 Pot-Limit Hold'em event. This latest triumph takes his World Series earnings to $954,500.